Listen up! It’s a book release party for A Din to Fight a Monster’s Ear, a chapbook celebrating Beacon Bards, the community-based south Seattle reading series which has been coordinated by Martha Silano for the past year. Readers/contributors include Kelli Russell Agodon, Caleb Barber, David Horowitz, Megan Snyder-Camp, Joannie Stangeland and Molly Tenenbaum. Show up! 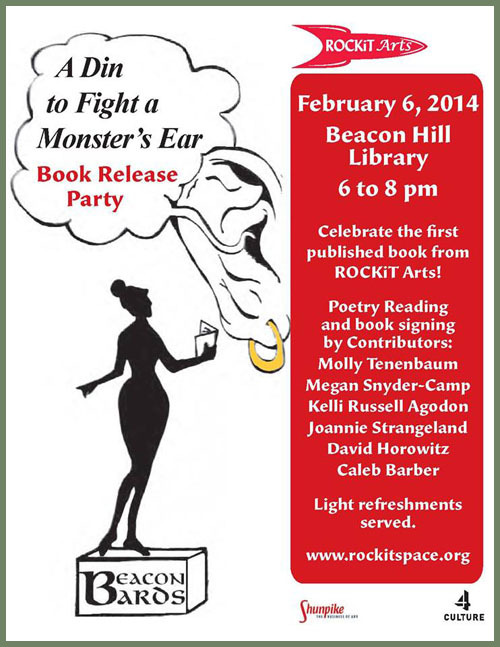 Thursday, February 6, 2014, at the Beacon Hill Library Community Room. More from Beacon Bards here. Jeffrey Morgan invites your participation in an upcoming class, Writing Poems: A Momentary Stay Against Confusion, to be offered at his Bellingham home on six Tuesday evenings, February 18 – March 25, 2014. Participants will write and read original poems, as well as provide and receive constructive feedback in a relaxed and supportive environment. Participants will also read short essays on the craft of poetry writing and discuss the work of numerous contemporary poets, including Bob Hicok, Tracy K. Smith, Matt Rasmussen and many others. The goal of this course is to bring a fun, low-pressure MFA-style poetry workshop to the local community. For those interested, poetry publication and packet/manuscript submission strategies will be discussed. Jeffrey Morgan is the author of Crying Shame (BlazeVox, 2011). Newer poems appear, or will soon, in Barrow Street, Bellevue Literary Review, Cutbank, Painted Bride Quarterly, Pleiades, Rattle, Third Coast and West Branch, among others. He’s taught literature and creative writing for more than 15 years at colleges and universities, including Penn State University and The City University of New York. He also served as a judge for the 2012 Sue C. Boynton Poetry Contest. For information or to reserve a place, send an e-mail to jwm222@hotmail.com. Have you written a haiku yet today? How about every day throughout the month of February? Why February? Because February is National Haiku Writing Month, also known as NaHaiWriMo — the shortest month for the shortest genre of poetry. The goal is to write at least one haiku each day for the entire month. It’s harder than it seems — are you up for it? For more information, visit www.nahaiwrimo.com, where you can learn about the myths and realities of haiku (and why it never needed to be 5-7-5 in English). You can also get involved, along with 1,600+ other people, at the NaHaiWriMo page on Facebook, where NaHaiWriMo founder, Michael Dylan Welch, provides daily writing prompts to inspire you. To learn more about haiku, check out “Becoming a Haiku Poet” and “Getting Started with Haiku.” There’s also a NaHaiWriMo Facebook page in French and in Bulgarian! Whether you write in English or another language, join in and write a haiku a day for February — National Haiku Writing Month! If you’re not on Facebook, you can follow @NaHaiWriMo on Twitter and tweet your daily haiku to #nahaiwrimo. The Bellingham Herald invites Whatcom County residents to show some love for the paper’s annual love poem feature in honor of Valentine’s Day. Selected entries will run in the Monday, February 10 Herald, and all accepted entries will run online at TheBellinghamHerald.com. Poems can be emailed to dean.kahn@bellinghamherald.com; mailed to ‘Valentine’s Day poems,’ c/o Dean Kahn, The Bellingham Herald, second floor, 1155 N. State St., Bellingham, WA 98225; or hand-delivered to the Herald customer service office. Please include your name, age and town of residence. Also, include your phone number, in case questions arise. The deadline to submit a poem is Friday, January 31, 2014. Here’s a post about another poetry walk that also makes a case for reading poetry with children. Sophia Compton, now on her way to start an English Literature degree at University College London, found herself with “some time off between school and University” and decided to do something worthwhile with poetry in the interim. For Poetry on Location, Sophia and Forward Arts worked with art groups, local schools and community organizations to select the right words and the right location. 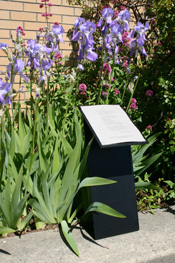 Ultimately, they selected words from Vikram Seth’s poem “Lost” for a series of paving stones in the northwest corner of Salisbury’s Market Square. “One of the most enjoyable parts of the experience was researching poets with a historic connection to Salisbury,” Sophia says. “There is a wealth of talent, from Sir Philip Sidney through George Herbert to Vikram Seth. But as soon as I read “Lost” from The Rivered Earth, and learnt about the connection with George Herbert I knew that those were the perfect lines for this project.” Seth’s words were carved in stone by local stonemason Harry Jonas. Calling herself “passionate” about poetry, Sophia credits nightly readings “with my mum” from the anthology The Rattle Bag, edited by Seamus Heaney and Ted Hughes, as the source of her interest. If you’re on your way to Stonehenge, Salisbury is only 15k away, so stop by the Market Square and read some poetry. Women of the World Poetry Slam. Four days, 72 of the best female poets in the world, one champion.